Back on the 3rd-4th October, Berlin saw its first Maker Faire! As the organizer of the Raspberry Jam here in Berlin I got really excited to hear that finally Maker Faire was coming to town so, I jumped at the chance to represent Raspberry Pi and Raspberry Jam Berlin. The goal was to let people know what the Raspberry Pi is and what it can do. 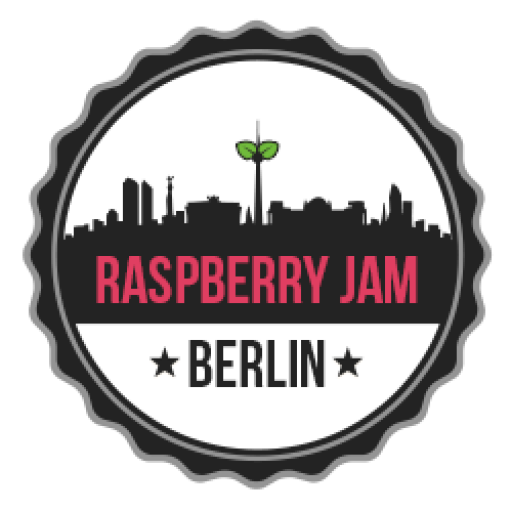 And maybe also to sneak in that there is a Raspberry Jam in Berlin for those looking for support and community. Phew – that was a lot of work to set up! It was extremely important to keep things simple but still show off the potential of the Raspberry Pi. The spinning flower, for example, might not look like much to veteran Pi users, but to someone new it’s showing the start of robotics. It’s showing that with a couple of wires and a motor you can make things move. Each display showed a key feature found in most Raspberry Pi projects: interface, data collection, connectivity and feedback. To avoid just having a mess of Pi’s on the table I made some display plates (painted 4mm MDF with a lot of holes, held up by sticks). Thanks also goes to Pimoroni for making acrylic versions for me! This kept things neat and also at eye level for kids who would be coming to the booth. Both days got really busy! There was a constant stream of people interested in the Pi. Special thanks go to my great team who helped out at the booth: Richard Ruston, Dr. Nana Schön and Florian Merz. Without their help and sunny disposition I don’t think our booth at the Faire would have run nearly as smoothly as it did. We also won a Maker of Merit ribbon. How awesome is that? What I can take away from the Maker Faire and the people I met is that education is very important to parents in Germany. They are looking for the resources and platforms to equip their kids for today’s technological world, and there are lots of choices out there. But it is all a little fragmented and maybe not always easy to learn. I found appreciation for the Raspberry Pi and what the Foundation is out to achieve. I found kids with wide eyes willing to learn, teachers desperate to teach and makers willing to share. This honestly validates the work that is going into the Raspberry Jam Berlin and makes it clear that I am on the right track. If you want to help, just get out there, go to your Jams, help out at your Maker Faires, volunteer at your local schools. Keep things simple but awesome. Engage with people and spread the word!